According to Pires Tomec write about the fall of Malacca, says that its lost influence in China and the Majapahit Palembang is due to rise of Islam in the region of Palembang own. The situation and conditions of this region into place Palembang Islamic Kingdom of Demak protection around year 1546, which involved Penangsang Aria from Jipang and Prince of Hadiwijaya Pajang, where the death of Aria Penangsang make the followers fled to Palembang. The Aria pursuivant Jipang this scare with the new build the Kingdom of Palembang. Figure Palembang is the founder of the Kingdom of Ki Gede Ing Suro. Kuto palace in the first hurdle, at this exact site in the complex, PT. PUSRI. Where is the tomb of Ki Gede Ing Suro behind PUSRI. From the form of a palace on the edge Java Musi river, the ruler adapt to wither on the surrounding environment. There were a akulturasi and asimilasi culture bred and wilt, which is known as cultural Palembang. Mas Ki Hindi figure is the kingdom of Palembang Palembang clarify the identity, ideology and cut off relations with the cultural center of the kingdom in Java (Mataram). He declares himself as a sultan, is equivalent to the Sultan Agung of Mataram. Mas Ki Hindi title Sultan Abdurrahman, which was then known as the Sunan Walang cinde (1659-1706). Kuto palace gate was burned out by VOC in the year 1659, due to resistance to Palembang on the teachings of the results less representative VOC in Palembang, Sultan Abdurrahman move to keratonnya Beringin beard (now as per the central dangangan). 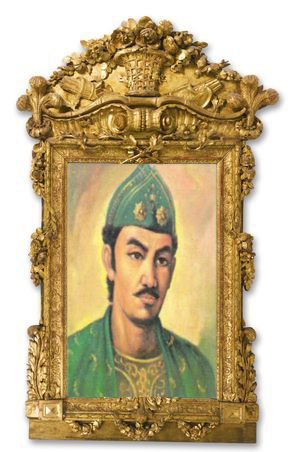 Sultan Mahmud I Baaruddin the title Jayo Wikramo (1741-1757) is a figure of Sultanate of Palembang, where the modern development. Among other Mesjid Agung Palembang, The Lembang (crater Tengkurep), Kuto stone palace (now standing Badarudin Museum and City Tourism Office of Jakarta). In addition, he also made canal in the region kesulatan, ganda that function, namely as a shipping channel, also for agriculture defense. Badaruddin Jayo Wikramo stabilize the concept of cosmological Batanghari Nine lebensraum as one of the powers of Palembang. Batanghari Nine is a concept Melayu - Java, which is eight wind directions from the center of sprawl, is the ninth over. The center or corner of ninth is in the palace Palembang (again more firmly in the hands of the powerful Sultan). From all ports in the region of the Malay, Palembang has proven and continues to be an exact port of the most secure and the most good, as expressed by indigenous people and European people. Once entering the waters of rivers, small boats, with the usual precautions of standby with the actions of seizure. The possibility that a hijacker hiding akan hijack boats that enter trade small river, rarely happens, because the strict vigil by the strength of the Sultan with all the equipment. In addition to the abundant wealth of the good service and trade, have the opportunity to make Palembang strengthen its defense. This in buktikan by Sultan Muhammad Bahauddin palace Kuto Besak established in the year 1780. Against colonialism in the Netherlands and the UK, Sultan Mahmud II succeeded to overcome Baruddin political diplomacy and warfare are two of the nation. Before the fall of Palembang in the big battle in the year 1821, Sultan Mahmud Badaruddin II years since 1819 have twice attacked the Dutch troops out of the waters of Palembang. Might Sultan Mahmud Badaruddin II is considered by the Government of the Republic of Indonesia is likely to be valued as a National Hero. 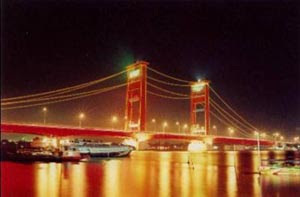 Palembang as the capital of Palembang Darussalam Sultanate at the time under the Dutch colonial government changed the classification of the total city. Initially, residential area of the city of Palembang, in the era of Sultanate of more than just the residential facilities. Settlement at the time it is an institution where patronage and alliance paternalis form due to the structure of traditional society and feodalistis. The entire system is in one environment and location. This system is known by the name gugu (k). Gugu vocabulary derived from it - which means goods Kawi said, diturut, be ignored. Each guguk have aspiratip or sectoral nature. Just for understanding but not the same, guguk this form can be seen with the system gilda on mid-century in Europe. Example the name of the settlement known as Sayangan, is the region where paramiji and alingan (down from the structure of the population over) that produces the results of copper. Sayangan means pengerajin copper (Javanese Kawi). This production is done on command from the nobleman who became the head (guguk) which is the protector of the two parties both miji and alingan (who dialingi / protected). This production is a result of the income for the sultan and the sultanate. Another example is the settlement in the region guguk, namely kepandean is diligent or blacksmith, pelampitan is lampit craftsman, as well as brass is a crafter of materials from brass. Settlements can also be aspiratif, namely one that has guguk one profession or the same position, such as guguk Pengulon, settlement of the pious predecessors and scholars around the Great Mosque. Similarly with kedemangan, the area where the village headman leaders stay, or Kebumen the place where Mangkubumi settle. Besides there are areas where certain groups live, is like Kebangkan settlement of people from Bangka, Kebalen is a settlement of people from Bali. After Palembang under colonial administration, then by Regering Commisaris JI Van Sevenhoven system perwilayahan guguk be parsed part. This solution not only split up the power over, while also memcah community system was subject to the monarchy, became subject to the colonial administration. Guguk made some of the village. Appointed as head of the village head, and in Palembang was divided into two areas, namely across across Ulu and Ilir. To rule this area was a village headman. Pamongraja village headman who is subject to controleur. Palembang city at that time consisted of 52 villages, 36 villages that are in the opposite ilir and 16 villages in the Ulu. Kampongs this number given the number from 1 to 36 for the ilir, while from the Ulu Ulu 1 to 16. Giving numbers this village full of enthusiasm at the beginning of the implementation, but the division does not develop even shrink. In the year 1939 the village became the 43 villages, 29 villages where the opponent ilir and 14 villages located in the Ulu. Contraction can be estimated administrative villages because this region is not required, but the amount of soul connection with a head tax. So for that digabungkanlah some villagers who cut soul minimal, and are simply a village head. Therefore, only the Head of the Village population, then for the Foreigners Eastern people, they have a distinctive head and Wijk. To the Chinese, with his head raised to rank as a military position, the Lieutenant, Captain and Major. Likewise with the Arab and Tamil (India / Pakistan) with the head of a Captain. To position the head of the Foreign East, are usually selected based on the statement of the amount of tax they will pungut and submitted to the government along with the guarantee fund begi position. Municipality of Palembang on 1 April 1906 to become one Stadgemeente. One of the autonomous government, where the city council of government. Residents call the city government is Haminte. Chairman of the Board of City is Burgemeester (mayor), he was elected by the members of the Board of City. Town Board members elected by residents of the city. How the city government is not formed for the purpose of fulfilling the interests of indigenous primary, but more to the interests of the West that are currently enjoying liberalization. The impact of liberalization because of the city as the center or the concentration of economic development, both as a port of export, industry, services trade and become headquarters of the employers. In the era of Japan (1942-1945), the structural changes in the position there is no headman. Only gelarnya are changed, that is to be me - and they were under the Co coordination Gun - Co.. Dititik its work on economic development beratkan war Japan. To tighten the line among the population, introduced a system environment of Japan, Tonari - gumi, the Rukun Neighbors that includes every 10 houses in a village. Tonari - led by a gumi Me - Mi - Co (Chairman of the RT).